We are pleased to announce the release of a new report, “Global Warming’s Six Americas, October 2014: Perceptions of the Health Consequences of Global Warming and Update on Key Beliefs.” This report is the seventh we have issued on the Six Americas – six segments within the American public that are characterized by distinct patterns of global warming beliefs, attitudes, policy preferences, and behaviors: the Alarmed (13%), Concerned (31%), Cautious (23%), Disengaged (7%), Doubtful (13%), and Dismissive (13%). Descriptions of the six groups can be found in the Introduction. The report then focuses on how each of the Six Americas understands the human health consequences of global warming as identified in the U.S. National Climate Assessment. We find that even the segments most concerned about global warming have little understanding of the current or future impacts on human health. This limited awareness strongly indicates the need for more public education about how global warming will affect human health. For example, an open-ended question asked respondents “In your view, what health problems are Americans experiencing from global warming, if any?” Only among the Alarmed did a majority (60%) accurately name a health problem associated with global warming (e.g., allergies, heat-related illnesses, vector-borne infectious diseases, etc.). Most respondents in the other segments had no response, didn’t know, or said there are no health problems from global warming. Most Americans also have little to no understanding that some groups within society are more vulnerable to the health impacts than others. Only among the Alarmed did a majority (66%) understand that some groups are more vulnerable than others and in a subsequent open-ended question, only 51 percent of the Alarmed were able to accurately name a vulnerable group (e.g., the poor, homeless, seniors, sick or disabled, infants or children, etc.). Most respondents in the other groups had no response, didn’t know, or said no groups or types of Americans are more likely than other Americans to experience health problems related to global warming. 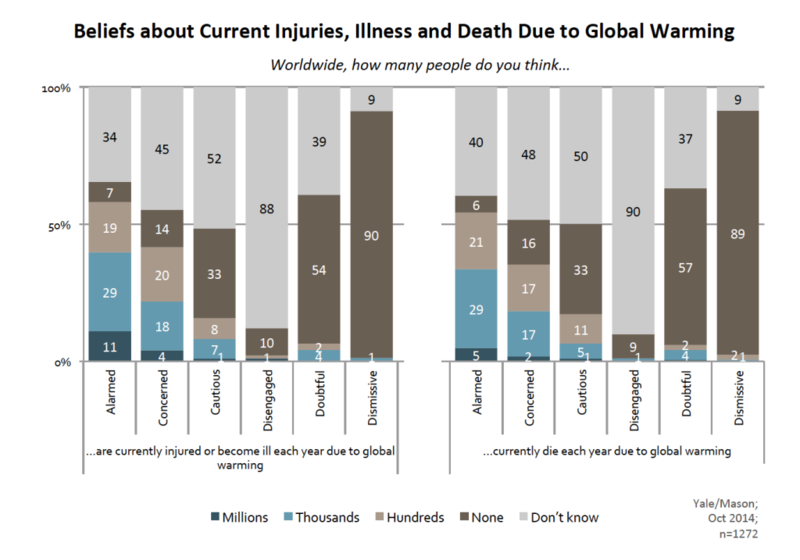 When asked to estimate how many people worldwide are currently injured or become ill each year due to global warming, majorities in all Six Americas say they don’t know, that no one is being harmed, or just hundreds of people. By contrast, a recent study estimates that 400,000 people worldwide currently die each year due to hunger and communicable diseases aggravated by climate change, while 4.5 million die from air pollution caused by the use of fossil fuels. The full report includes the key beliefs and demographic characteristics of the Six Americas. It focuses on their awareness, understanding, and risk perceptions of the human health impacts, desired level of response from government to address the threat, support for funding health agencies, and trust in different information sources on global warming-related health problems. The report is by Connie Roser-Renouf, Edward Maibach, and Jennifer Kreslake of George Mason University, and Geoff Feinberg, Seth Rosenthal, and Anthony Leiserowitz of Yale University. 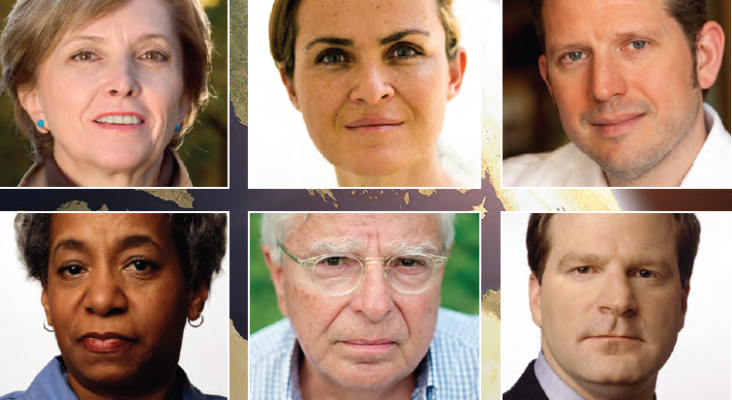 Roser-Renouf, C., Maibach, E., Leiserowitz, A., Feinberg, G., Rosenthal, S., & Kreslake, J. (2014) Global Warming's Six Americas, October, 2014: Perception of the Health Consequences of Global Warming and Update on Key Beliefs. Yale University and George Mason University. New Haven, CT: Yale Project on Climate Change Communication.